1 photograph; b & w; 6.75 x 4.5 in. 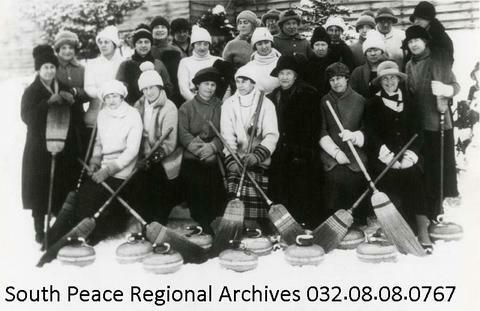 Group photograph of the Grande Prairie Ladies’ Curling Club posed with rocks and brooms. Front row, left to right: Mrs. MacPhee, Mrs. Harmer, Mrs. O’Brien, Mrs. Grisdale, Mrs. Christie, Mrs. W. C. Pratt, and Mrs. Porteous. Second row: Mrs. James, Mrs. Graban, Mrs. Turner, Mrs. D. W. Pratt, Mrs. Percy Jones, Mrs. Hackett, Mrs. McMillan, Mrs. L. Smith, and Mrs. Bell. Back row: Mrs. ? (Bill Storm), Mrs. Mead, Mrs. Thomson, Mrs. Minchin, Mrs. (F.) Flood (J. Patterson), Miss James, Mrs. F. McDonald, Mrs. Fredette, and Mrs. Howell. Mrs. Evans was away. The photograph was obtained from Mrs. D. W. Pratt by Mrs. Erna Talbot.